Window tinting is perhaps something you may think is only good for sun control in homes, offices and retail settings but the truth is, it is much more powerful. A feat of modern engineering, window film is an incredibly potent development, that can drastically increase the quality of life here in Spanish Fork and save people money. As it were, privacy window film serves a variety of purposes for both privacy and sun control too! 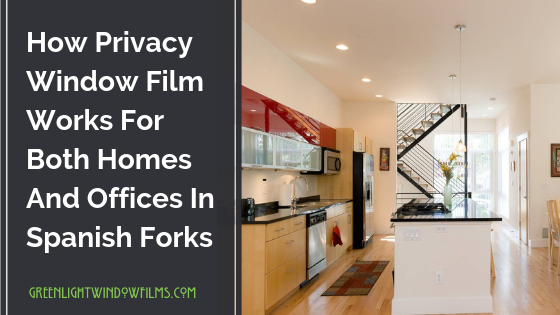 Privacy window film is a fantastic way to make your Spanish Fork home or officeFor more private and safe. The best part is, you can customize how much or little coverage you want so, you get a level of privacy that works for you. But as mentioned, privacy window film also offers a number of benefits relating to solar control and even security for your Spanish Fork home or office. Read below to find out some of the vital benefits window films will provide for Spanish Fork homes or offices. Tinting the window of your home or office, of course, makes them darker which keeps your belongings, family, and employees out of view of the general public– reducing crimes of opportunity. However, since window film also keeps glass in place after repeated blows, it is a massive deterrent to would-be thieves, who leave after striking the glass many times without being able to penetrate it. For Spanish Fork homes and office building’s high energy bills can be problematic year-round both because of Utah’s extreme weather and since we get 4 distinct seasons here. Window film on your Spanish Fork home or office drastically reduces solar heat gain which lowers A/C bills and keeps heated air from escaping out during the Fall and Winter. In office settings, the sun’s glare makes it hard for employees to see computers and it strains the eyes. In homes here in Spanish Fork, the glare through windows is intense (and hot) which makes some rooms in your home uncomfortable and virtually unusable at certain times of the day. Window film stops glare, and some films even redirect light further into buildings. This allows for more comfortable productive spaces to live and work in Spanish Fork. For more information on window film for your Spanish Fork home or office contact us at Greenlight Window Film. We serve all of the Salt Lake City area, including Spanish Fork and are happy to help you with your window tinting needs!